Rome finally agreed to send an official emissary to Augsburg. However, before this trial convened, the pope had already pronounced Luther a heretic—demonstrating the true spirit of popery. Thus Martin Luther stood on the Protestant principle that the Scriptures have the highest authority. He maintained this position at the Diet (general assembly) of Worms as well. The Reformer answered: “Since your most serene majesty and your high mightinesses require from me a clear, simple, and precise answer, I will give you one, and it is this: I cannot submit my faith either to the pope or to the councils, because it is clear as the day that they have frequently erred and contradicted each other. 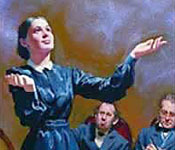 Unless therefore I am convinced by the testimony of Scripture or by the clearest reasoning, unless I am persuaded by means of the passages I have quoted, and unless they thus render my conscience bound by the word of God, I cannot and I will not retract, for it is unsafe for a Christian to speak against his conscience. Here I stand, I can do no other; may God help me. Amen.” —J. H. Merle D'Aubigne, History of the Reformation of the Sixteenth Century, b. 7, ch. 8. God had his hand over Martin Luther, and as he made his way back to his home, some of his friends seized him and secretly whisked him off the castle of Wartburg. From there, he continued to provide much needed encouragement and light in the form of tracts and, eventually, German translations of large portions of the Bible. The next major advance in the Protestant Reformation was made by a number of German princes at the Diet of Spires.